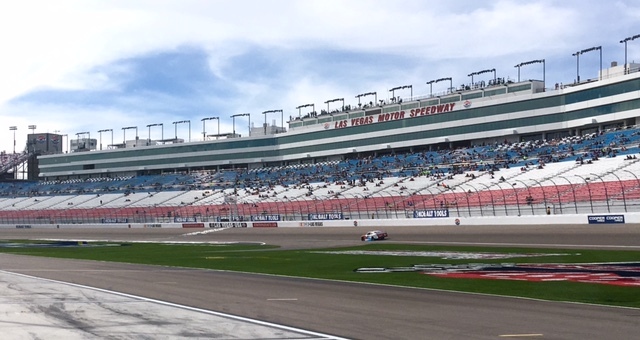 Ray Black Jr. Secures First Top-25 Finish in NASCAR XFINITY Series at Las Vegas Motor Speedway - Ray Black Jr.
LAS VEGAS, Nev. (March 6, 2016) – After two tough races in a row, NASCAR XFINITY Series driver Ray Black Jr. and his SS Green Light Racing team finally had the solid weekend they were looking for at Las Vegas Motor Speedway. The driver of the No. 07 ScubaLife.com Chevrolet battled a tough-handling race car all weekend long but consistently made gains on the track to finish in 25th place in the Boyd Gaming 300. Black and his team had their work cut out for them, as they arrived in Las Vegas with a brand new Chevrolet Camaro with no real knowledge of how it would perform on the track. Throughout practice the team worked on loosing up the car for Black as it was extremely tight in practice sessions before he secured a 27th position starting spot for the race. Once the green flag dropped, Black raced between 24th to 27th place for the majority of the event. Handling swayed back and forth throughout the day for the team, going from being too tight one lap to snapping loose on the next. Regardless, Black kept after it, and the team was able to see a respectable finish come as a result of their efforts. Black’s next race in his 2016 NASCAR XFINITY Series season will be the Axalta Faster. Tougher. Brighter. 200 on Saturday, March 12 at Phoenix International Raceway. Keep up with Ray Black Jr.’s West Coast Swing by following him and his sponsor, ScubaLife, on Facebook, Twitter and Instagram at @TeamScubaRacing and @RayBlackJr.